Move over Woolworths. These cafes and caterers send out menus, and prepare creative, fresh supper portions on weekdays. Most expect cash payments when you collect (a few do deliveries), and some even accept same-day orders. Chardonnay Deli. Place same-day regular or vegetarian orders before 10am, and collect by 5.45pm. Expect lamb pie and salad, bangers and herb mash with relish, or butternut and black bean curry with quinoa. From R60 per portion, free-range meats and quality ingredients are used creatively. Extra veggies or salads cost R35 per person. Or select from their similar selection of supper meals in-store for R60. Main Road, Constantia. 021-795-0606, Chardonnay Deli. Dish Food & Social’s Gourmet Garage Monday to Friday supper service accepts same-day orders by 10.30am, for collections between 5pm and 7pm from an Oranjezicht home (from R75 per portion). Or sign up by 10am for their winter Tuesday Special (pot pies with veg, or butter chicken with rotis) for four, at a feel-good price. Collect Tuesday Specials only at Liquorice & Lime cafe in Higgovale. Deliveries possible. 021-447-0323, Gourmet Garage menu. Food of grace. Anleroux van Schalkwyk cooks and delivers good-value, no-frills meals in glass bowls (they are returned) within a 10-kilometre radius of her Stellenridge home, near Tyger Valley. She produces bobotie to bacon and mushroom pasta bakes. Sign up for three to five weekdays; it’s cheaper for bigger families. From R280 per couple or R620 for a family of six, for a three-day week. 021-919-3043, Food of grace. My Basaar. 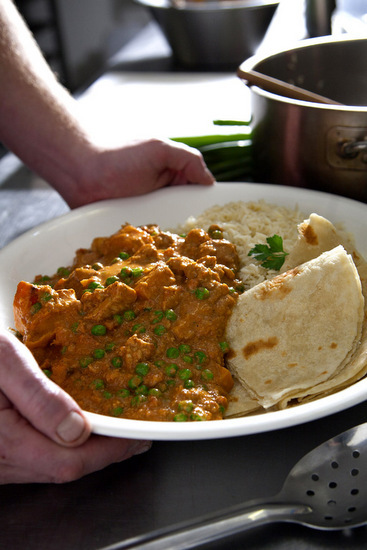 Bernice van der Merwe’s cafe offers a ‘take-out dinner Tuesday’ butter chicken, basmati and tzatziki service for R65 per portion (order by 12pm; collect between 4 and 6pm). On other weekdays, order the day before for prebaked chicken or venison pies, or chicken or beef lasagne feeding two to six, at R55 to R65 per portion. Collect by 4pm. 16 Loop Street, Cape Town. 021-421-6391, My Basaar. The Flying Pan. Chef Mathew Hoepner cooks and delivers on Monday to Friday, from Westlake and southern suburbs to the city bowl. Order by 12pm the day before. 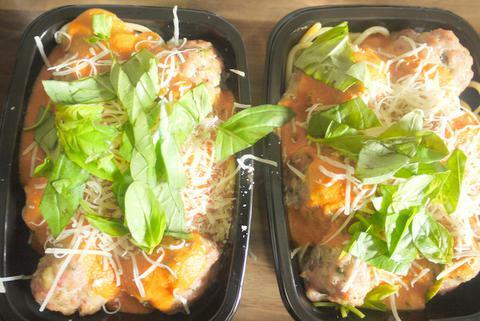 From R55 or R65 (regular or low-carb) per portion, including delivery. Expect healthy meals with made-from-scratch sauces such as spaghetti puttanesca (carrot and pumpkin is the low-carb alternative) and beef vindaloo with basmati (cauli rice is the low-carb alternative). Ensure somebody is available to receive office or home deliveries as they don’t commit to specific delivery times. 081-385-5589, The Flying Pan. A version of this appeared in The Times on 13 May 2015.